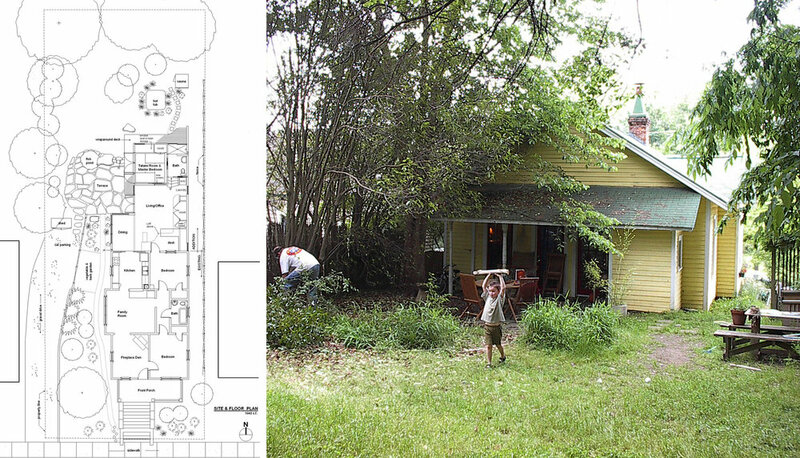 This addition to a 1923 bungalow in downtown Raleigh was designed to be a highly flexible space in order to house multiple functions for a family of four. The program required that it accommodate dining, living, office, laundry, bathing, sleeping, and storage, all in a 650 s.f. addition. 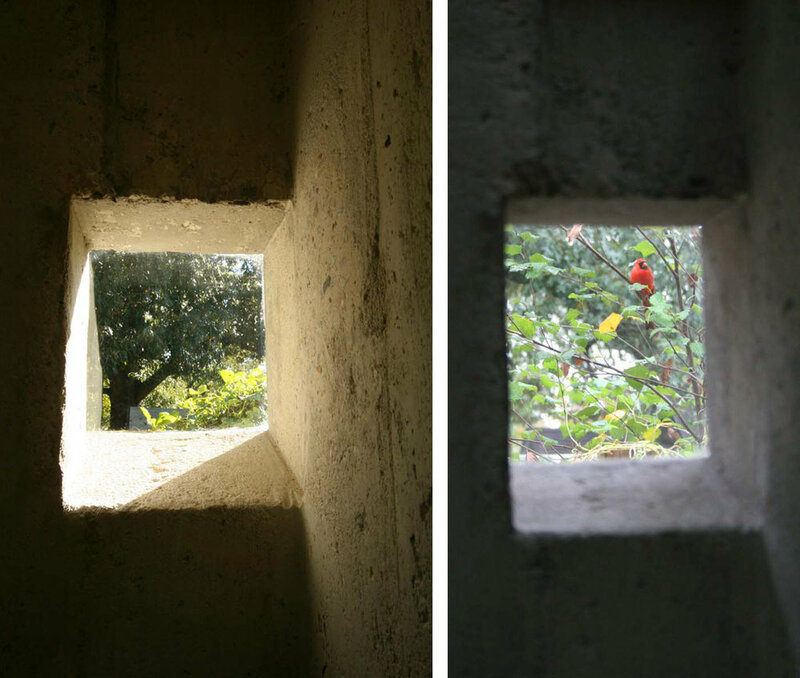 We designed the addition as an interior "plaza", with two houses facing into it. 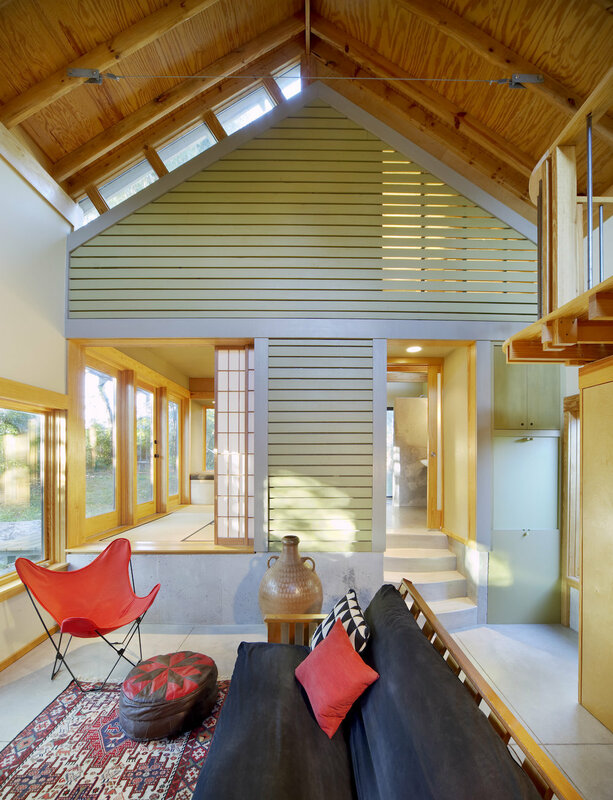 The "Tatami House," and the "Original House," each sided in exterior horizontal siding, giving an ambiguous indoor/outdoor quality to the space between them. The facade of the original bungalow was preserved, including existing exterior windows and doors. 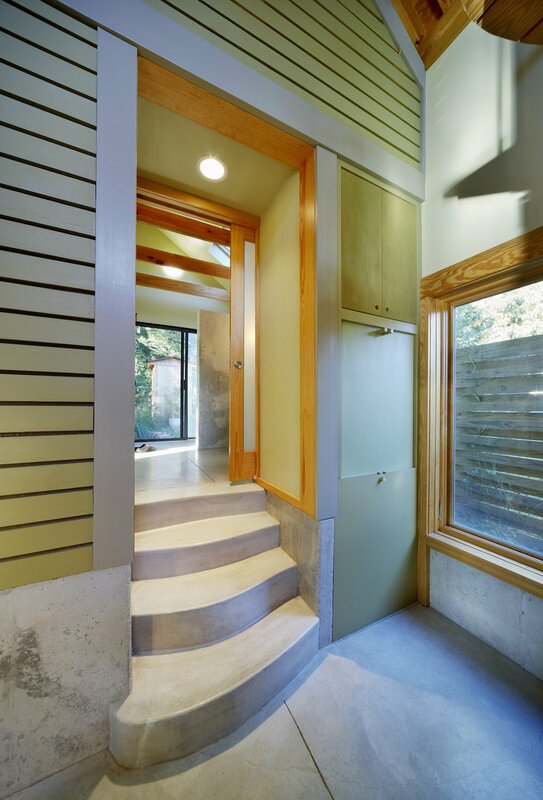 The concrete floor is reminiscent of the patio that was previously there, rising up to form entrance steps to the "Tatami House." We chose to treat the bedroom as both public and private, accommodating private use at night and other uses during the day. A window seat cabinet offers easy storage of a futon bed and shoji screens slide out for privacy or disappear for openness. The ability to open up this private bedroom to other functions, and to share its light, view and access with the rest of the house, is key to the home's feeling of spaciousness. 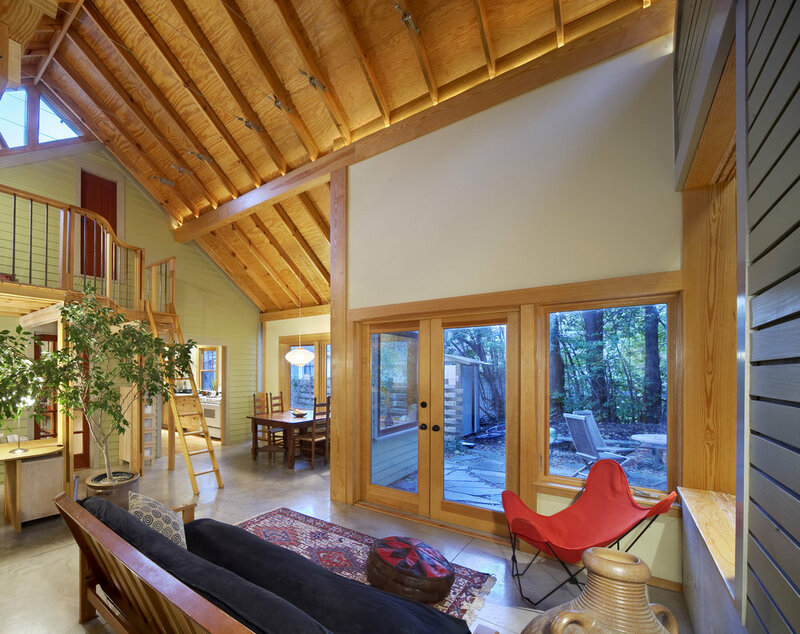 The entire addition is a flexible space, becoming a living room, dining room, rec. room, concert hall, nerf gun battlefield, and more, depending on the occasion. 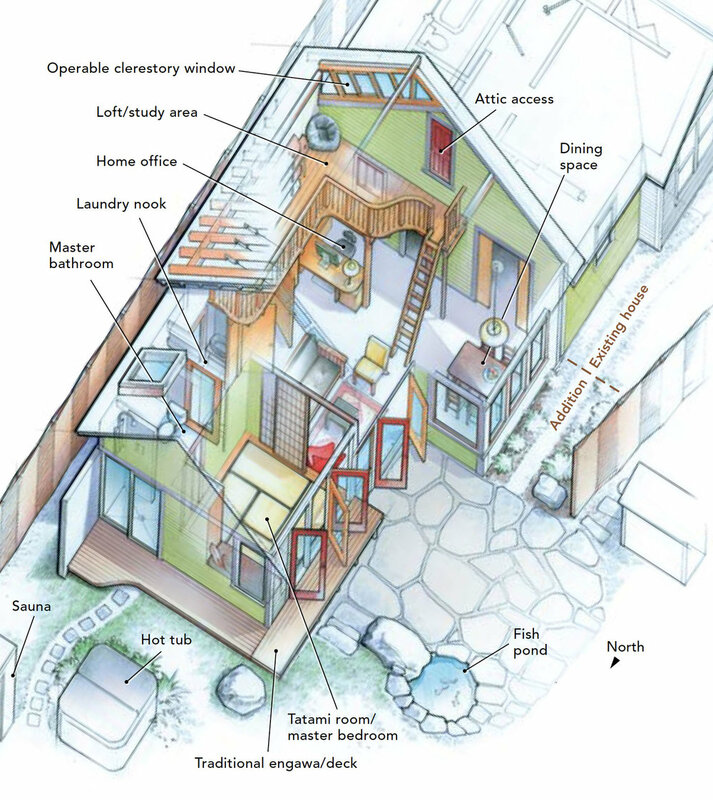 The intense, multiple use of space makes this small home perform big. Similarly, by discreetly tucking a laundry niche in the corner of the larger room, hidden behind sliding plywood panels, it can co-exist with more public uses, saving valuable square footage. With adjacent patio and wrap-around deck, doors can be flung open and interior spaces spill outside. Continuous with a street of older bungalows, the house is a story of transformation from front to back, growing and changing as the family has, from original, to modified original, to new.